The flowers are little and deep purple as you can see, and also came in like some sort of ball shape at the end of a stick. The plant is like 30 cm tall, a pseudobulb like round oval shaped, kind of the same size of both leaves that come out of it. The stick with the flowers comes out from the joint of the two leaves and the pseudobulb. In the photography the orchid behind the flowers is NOT the one where they come from. The stick holding the flowers is long, like one and a half meters and it bends over the weight of the flowers. A little of the leaves from the actual orchid can be seen on the lower left corner of the picture. It is in Spanish but the picture is there without name. This page says is from my country, from cold high elevated locations, even though I have it one block away from the beach (really hot most of the year -average 90ºF- and no humidity), and it blooms here between April-July. I think it might be an Epidendrum, but no idea of what specifically. Hope you might help me, because I have a couple more I cannot identify. One I think is a Catasetum, the other might be another epidendrum. I'll post pictures of them when I get my camera back. This is an old picture, I'm organizing my archives. Sorry about all the text this is my first time asking and I try not no miss anything. P.D: I want to apologize myself for any grammar or semantic mistakes I could have written on my description, English is just not my first language. This plant is a Schomburgkia species. These plants are close relatives of Cattleya and Laelia orchids. Two species that look similar to your photo and are native to Venezuela are Schomburgkia undulata (which typically grows at elevations of 600-1200 meters, often with fairly warm temperatures) and Schomburgkia rosea, usually from elevations of 30-200 meters and also accustomed to hot conditions. Schomburgkia rosea is my best guess, but I can't be certain. After I told my mom I've made the post she got in her library and throw me like a pile of books where we find it!! I'm posting another doubt, one one I run through the web and the books and haven't found it yet!! Thank you very much for you speedy reply! 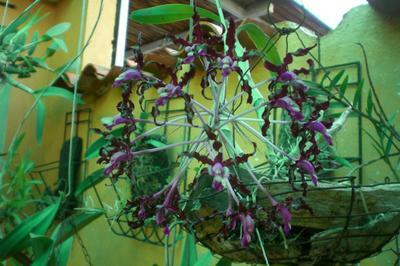 Recently I have found that this one was renamed to laelia undulata... is this true? How can I track when a name change happens?